Making Peace With Our Cyborg Nature : 13.7: Cosmos And Culture What rankles so many of Lance Armstrong's detractors is the sense that somehow, he artificially enhanced himself to reach seemingly superhuman heights. Yet the story of modern humans, argues philosopher Alva Noe, is a story of our integration with artificial and mechanical enhancements. 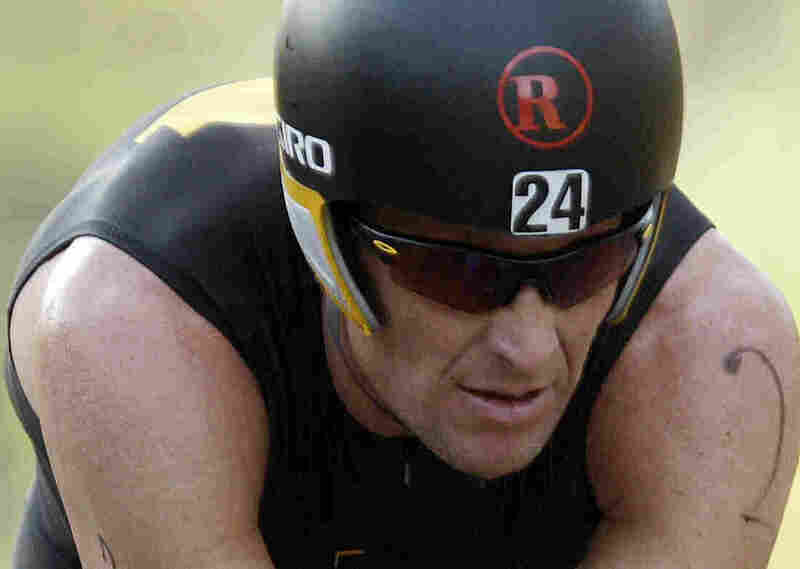 Lance Armstrong competes in the Ironman Panama 70.3. triathlon in Panama City, Panama. I loved the TV show The Six-Million Dollar man growing up. For me, Steve Austin (played by Lee Majors) wasn't less cool because he had bionic implants that enabled him to perform superhuman feats. He was more cool. For millions of years, our ancestors survived with only the crudest implements. Some 35,000 to 75,000 years ago, a technological revolution took place on an extraordinary scale. Innovation now abounds in the archeological record. Whereas before, generation after generation used the same blunt pounding tools, now we find highly refined instruments for cutting. And we find tools for making tools. We find an increased diversity of building materials and evidence of real specialization in tool use and tool making. We can also date back to this time the emergence of graphic art, clothing and, we speculate, language. What explained this burst of technological progress? Did we get smarter? Or did denser populations, trade and other changes in our mode of living make it possible, for the first time, to build on each generation's innovations? However we answer these questions, this much is clear: The appearance of cognitively modern human beings is coeval with the integration of human living with the innovative and productive use of tools. We are truly the tool-using species, not because we are the only species to use tools, but because the use of tools is essential to what we are. Tools organize us. We see this everywhere we look. You can only frame a thought about a negative integer thanks to the availability of our shared notational tools. Science, art, law, politics — can we imagine any of this without writing? Can we imagine ourselves in the absence of all this? The simple answer is that we cannot. We like to think that here is the person and there the tools he or she uses to solve this or that problem. But in fact, the tools are internal to the kind of lives we live, and so to the kinds of problems we face. If we lacked shoes and cars and planes, we couldn't carry on the kinds of projects that we do. Or, think of the way that communication technology organizes a workplace. Remove the communication technology — phones, email, social networking software — and you don't have the same organization minus the technology. You have something different, something disorganized. Whether we think of knowledge, or communication, or perception, or medicine, or commerce, or the arts, we live in a vast web of organized human exchanges and shared practices. We are technologists by nature. Or to use philosopher Andy Clark's apt phrase: We are natural-born cyborgs. The point is not just that we couldn't do what we do without tools. The point is that we couldn't think what we think or see what we see without tools. We wouldn't be what we are without tools. Making tools, changing tools, is a way of making new ways of being. Technologies are evolving patterns of human organization. Consider: We are animals who can digest milk. But only because we first domesticated milk-bearing animals. When we did that, just a few thousand years ago, we genetically engineered ourselves! So let us turn now to the case of Lance Armstrong. He is a trailblazer. One of the greats. He didn't win races on his own. No, like each of us in our social embeddings, he created an organization, one drawing on other people, and the creative and effective use of technology, the mastery of biochemistry, to go places and do things that most of us never will, and that no one ever had, before him. That we now attack him, and tear him down, and try to minimize his achievements ... what does this tell us about ourselves?